So apparently I'm obsessed with Sriracha. I can't help it... it's just so delicious! I'm not really into meatballs - maybe it's the name or the shape, but they just aren't for me. Butttttt, when I stumbled upon this recipe, I knew that I had to try it. 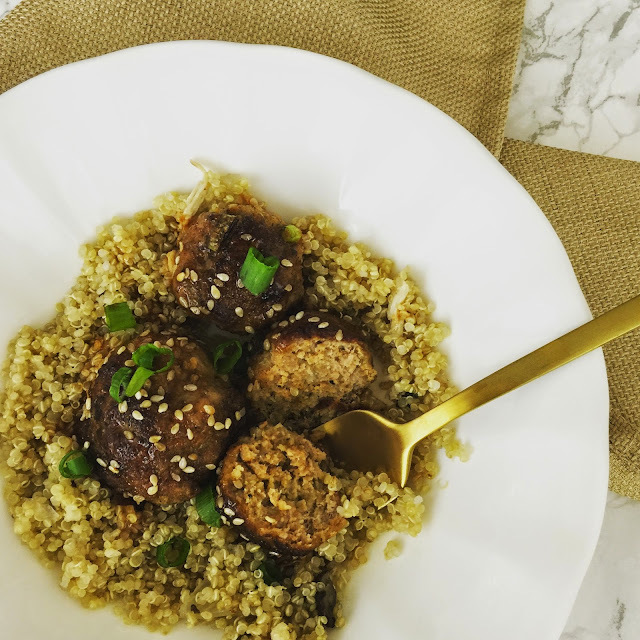 Combine all of the ingredients and form into meatballs. Heat 3 tbs of oil in a pan, and brown the meatballs for 2 minutes, flipping halfway through. Transfer the meatballs to a lined baking sheet, and bake for 10-12 minutes at 350 degrees. While the meatballs are baking, make the teriyaki sauce. Combine all ingredients in a sauce pan and stir over medium heat until the honey is dissolved. Once the sauce is complete, add 2 tbs of sesame seeds. 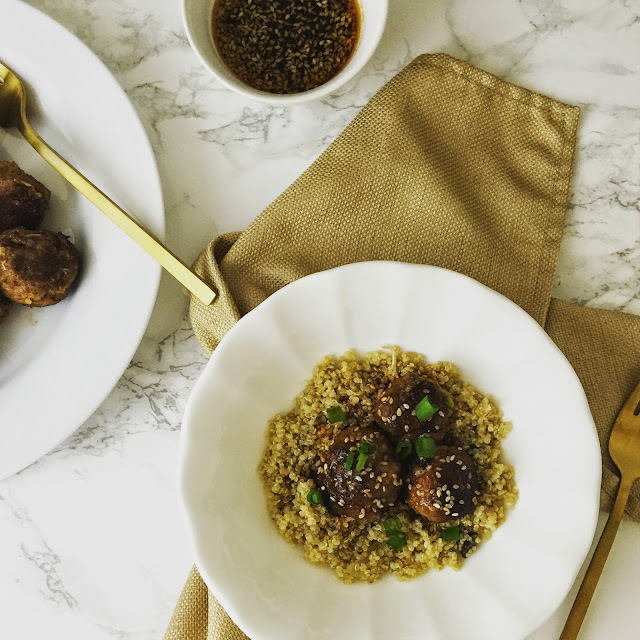 Once the meatballs are done baking, pour over the sauce and serve with a side of quinoa (or brown rice!). 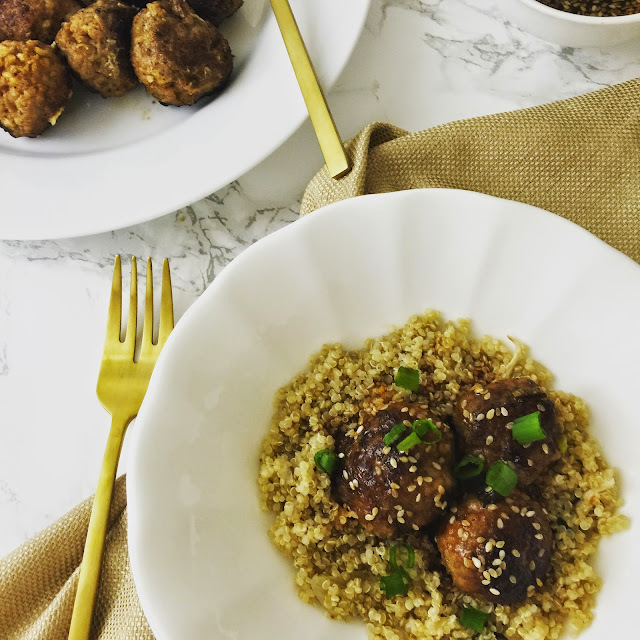 I was surprised at how much John enjoyed this dish (probably because it is very different than most things I make), and it will definitely be on repeat! Meatballs have always strangely creeped me out for some reason. I guess because almost anything could be in them...same goes for mysterious casserole dishes that people often bring to family gatherings. Haha. But these look delicious! 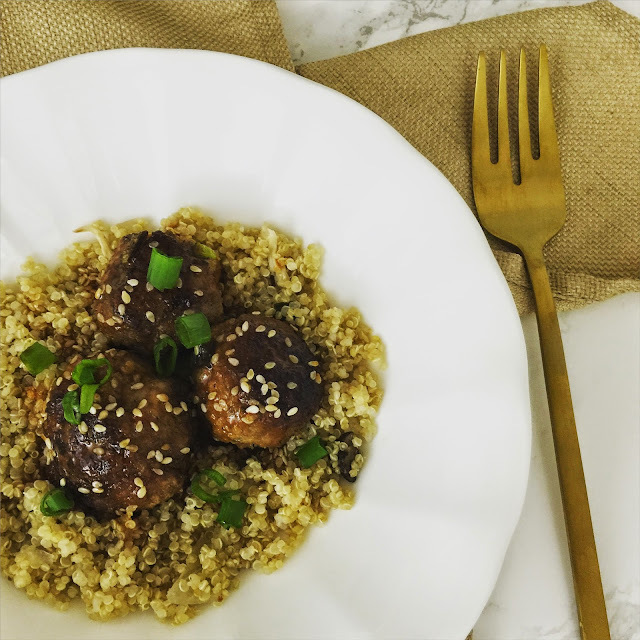 Having grown up with two Italian grandmas, I'm no stranger to meatballs but I love this new, Asian-inspired spin on them! Um, yum! You had me at sirracha - I love anything spicy! I just had sirracha for the first time last week (late to the party, I know!) and loved it so these sound amazing! I will probably make this asap, we would both LOVE this! Ooh what a great way to mix it up with meatballs. I have a bag of turkey meatballs in the freezer so I may try a version of your sauce with them! Definite make if it has the word siracha in it! Spicy is my middle name! Interesting little fact about the meatballs. I'm curious if you like meatloaf? These sound AMAZING. I love a good meatball and sriracha is THE BEST condiment. Love it! This sounds sooo good! I'm funny about meatballs too, they're usually something that I think sounds good but once I actually go to eat them I don't really like them. The sauce sounds so good! Yumm - Im sriracha everything! Especially cucumbers with sriracha - my go to snack!